Does anyone find a fundamental problem when solving go problems that you *know* it's a problem and therefore look for the 'tricky' move, where you'd normally not give it a second glance? I find that when doing problems it doesn't help my real game that much because in a real game I tend to play solid/'standard' moves without necessarily looking for a tesuji. I mean obviously some things ring a bell - but reading every variation in a game can be time consuming and not always economical. Does anyone have any suggestions to get around this? Perhaps it would be better adapted to have a 'best move' type scenario where a tesuji isn't always necessary - a simple strengthening of 2 weak stones for instance. When looking for the 'trick' move I often lose sight of the normal, solid connection. Not sure who'd want to publish this though! Sorry if this has been broached already, I couldn't see anything on here immediately addressing it! I have the same problem. Talking to my sensei, he said that in his opinion, problems shouldn't be "black to play and kill" or "black to play and live", but instead something like "which is the status of the black group?". That way, you have three different options (dead, alive, undefined), and those are the three options you would have in a real game. I think there is an easy way around this on websites like goproblems.com -- problems could include the option that a group is dead/alive and cannot be saved/killed. That would be a more game-like practice. Dieter: The more tesuji exercises you make, the richer will become your repertoire of "standard" moves. The more tsumego you solve, the better will become your awareness of killable groups and the sharper your judgment of whether attack or defense of a group is profitable/necessary. The ratio of usefulness is quite far from "solve one problem exercise -> deal better with one game position". That's why one often hears the advice of doing many easy problems, rather than one complicated one. Velobici: Reading is everything in Go. If you can't read, opponents will rip you apart, making overplays that you can not punish, and killing groups that should live. They might even just exploit the advantage for a few points each time groups near each other thereby accumulating an overwhelming lead. Practice is the only way to improve one's ability to read. Go problems are the tool that one uses to practice. The problems should not be too hard...solve them in 30 seconds or less. Do a lot of problems. An hour a day, if you can find the time is very good. Professionals do problems all the time (rather harder than the ones that we do ;). Jan van der Steen has provided access to problems from the Korean Baduk Academy. Reading is the basis for everything. Problems improve your reading. Remillard: I have to throw in here with what's been said. Doing a problem with the idea that "I will use this idea in my next game!" is self-defeating. 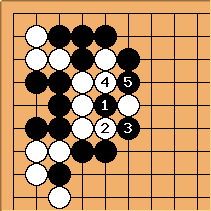 For example, I have never used the Crane's Nest Tesuji (one of the reasons that I find the GoProblems.com kyu test silly; this tesuji shows up twice). Ideas that you CAN say "I will use" tend to be grander in scope "I will evaluate the balance of power and territory every move." However, problems tend to help you think about what's possible in a local sense so that you have a truer understanding of the whole picture. Also it trains your mind to project, think of possibilities, play branches, etc. All of these are different but is wrapped up in "read". HolIgor: It is very difficult to believe that the crane nest tesuji did not happen at least in the variations. People know it and would not allow you to use it in the actual game but in the look ahead it happens very often. Look at the o-nadare joseki, for example. White has to defend at 3 to prevent this disaster. Remillard Well it's possible that it's been avoided. I know I've never had to defend that sort of thing, but it could be my style does not lend itself to producing those sorts of shapes. 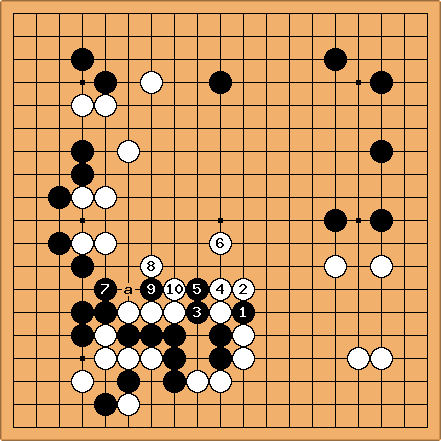 But, a naive look at a Go problem might suggest "Oh, the crane's nest tesuji. I will know how to capture these stones in this shape" whereas the POINT is "avoid this situation, because the punishment is devastating." My point was that it's important to not get caught up in the first level point of a problem. Dieter: If both players think this way they will both avoid the crane's nest because they know something terrible will happen but neither would know how to punish his opponent if he tries to lure out the three cutting stones. I believe that indeed a lot of games are played with this kind of attitude from both sides - and I'm not excluding mine. With such an attitude, describing one's own style as "peaceful" or "calm", one will be defeated by trick players time and time again. The correct attitude surely is to know all the tricks but not play them (except maybe if there is really no other way to win). kvas - I've actually seen a tournament game between two 2 dans that was lost by a crane's nest tesuji. Well, not in the classic form, but some complex fighting lead to black's damezumari with a shape similar to crane's nest. I am very grateful to and admire the players who brought up the ogeima at 3-4 point, high approach, ogeima. Before, I would assume without analysis that something terrible happens when you play it. Now I believe, for the time being, that this is not the case, thanks tot the above analysis. This goes to show that dan players can learn a lot from beginners. The latter have not been contaminated with joseki diseases and play a fresh kind of Go. kokiri - the more that you practice these sorts of problems, the better your sense of what positions have weaknesses that are likely to give rise to a tesuji. Thus you not only get better at reading but better also at judging where to read and where to play instinctively. unkx80: I would say that doing many Go problems usually does not mean that these can be applied to games - it is not memorization. Rather, it trains on intuition, the ability to recognize certain shapes and patterns, so that in games, one can intuitively pinpoint some probable starting points, and most often one or more points can lead to the best result. I think this is what some people call sharpness, the sensitivity to certain weaknesses in certain groups, and seldom there is a need to do exhaustive searching. Of course, the rest is all about reading, so doing many Go problems can train on the reading ability too. dnerra: I think one point that is still lacking from the discussion here, and which is related to what unkx80 is saying above, is that it does matter how well the problems are selected. E.g. I really like goproblems.com for the fun of it, and many of the positions are realistic as they come from amateur games, but a I think to improve your go strength it is much more useful to do the problems from a good problem book. The point is that (if it is a good book) the problems are selected to train the intuition where the typical player of the target audience (i.e. a certain level of players) is usually lacking it. Doing a good life-and-death book will certainly train your judgement about weak groups. Other books will help you see damezumari and related shape problems coming much earlier. Some collections just trains your ability to read deeply and accurately. bobulatorm: speak of the devil, i just used the crane's nest on someone who didn't realise until it was too late. White 6 was lucky, but i suppose being aware of how this tesuji manifests itself in real life might have changed matters - i think i've just contradicted my original point though ;) i suppose getting to pull stuff like this off will become less and less likely as me and my opponents get better though. oh well! unkx80: This looks like an example of using tesujis blindly. at a captures the stones more cleanly and leaves better aji. Anonymous: Black 7 is the Get Strong at Humiliating Debutants tesuji. pajaro: Instead of the crane's nest tesuji, let me use another example: ladders. There is a proverb that says that you can't play go if you don't know ladders. How many ladders have you played out in a real game? Or in a game you watched? Probably none. But in how many have you had to think about a ladder? Probably all. So what? It is something that is there and you must know or else you just can't play. Tsumego is the same. Perhaps the shapes that appear in problems won't appear in a real game. But if you get used to read problems, you will be more likely to know if a group is dead or alive (in a real game, I mean) and you can save moves. Bob McGuigan: Working through many tesuji problems can definitely help in real games because it develops your ability to know which shapes allow different tesuji moves. Even if you work on the Segoe-Go tesuji dictionary problems, where you know which tesuji you are looking for, you will improve your ability to see them in real games. Carefully reading out all possible variations in a life-and-death problem, even if it is a shape that will not occur in a real game, is also beneficial. In particular your reading speed will increase, and you'll be less likely to overlook responses by your opponent when analyzing a position.